Julia Snowden has come home to help her family put their business, the Snowden Family Clambake Company, back in the black. Having achieved this, she is now teetering between going back to work in Manhattan or staying in Maine with her family. She's not sure she's ready to make a commitment, but she is sure she's in love with her middle-school crush, Chris, who has a shady past of his own they've never discussed. One morning she has a mini-confrontation with David Thwing, the "Mussel King," on the pier. It seems David is in town to start his own restaurant business, which will compete with the Snowdens' and he tells Julia pretty much up front that he will be putting them out of business. But before he is able to even get started, he's found dead, hanging from the lines beneath one of the lobster boats belonging to a friend of her brother-in-law, Sonny. And when that friend, Peter, can't be found, it's assumed he's dead, in the cold waters off the coast of Maine. And since Peter's wife, Lorrie Ann, tells everyone in earshot that it wouldn't have happened if Sonny had been with Peter, Sonny becomes the number one suspect. It doesn't help when Sonny won't tell anyone where he was the morning David was killed, and when Julia's sister Livvie, now pregnant, asks her to find out where Sonny was, Julia can't help but become involved in the investigation. And when a young woman arrives in town, presumably David's business partner, Julia gets the feeling that she's not telling everything she knows to the police. You can't help but get involved with the people of Busman's Harbor; they are both quirky and endearing, (I'm especially fond of Quentin; intelligent and generous;) each in their own way. 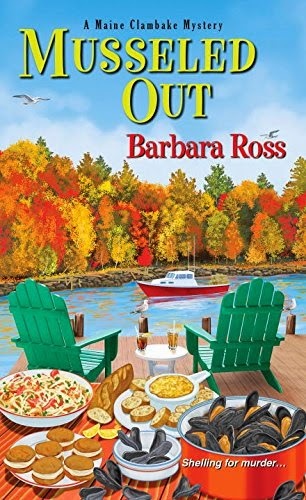 Ms. Ross pulls us into her world of Maine, an entirely relaxing place to be - even if, right now, filled with the question of who-murdered-whom. When the answer finally comes, it not only feels believable, but rather sad, in more ways than one. This book was not only a pleasure to read, but with enough twists and turns to rival a roller coaster. There were several subplots, involving Julia's mother, the island where they hold the clambakes, Chris' past, Gus' restaurant, and even the island cat, Le Roi which had just enough of an intrigue themselves to fill in the mystery without becoming tedious or superfluous; if anything, they added to the enjoyment in reading. Although it is easy enough to peek at the end, I urge you not to do so; follow through and you will not be disappointed. Highly recommended.